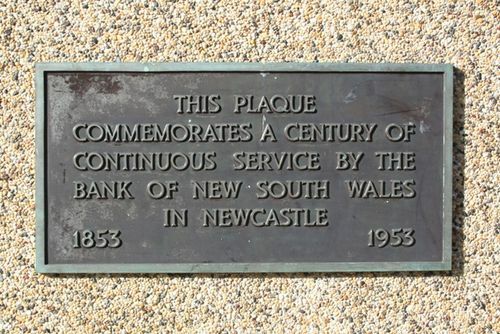 A plaque commemorates a centenary of continuous service of the bank in Newcastle from 1853-1953. Today the Bank of New South Wales celebrates the 100th anniversary of the opening of its branch in Newcastle will take two forms. This afternoon the Lord Mayor of Newcastle will unveil a commemorative plaque set in a facade of the bank in Hunter Street and later there will be a party at the bank, attended by representative Newcastle citizens. Tomorrow there will be a late afternoon party at the bank for staff and wives of officers in the Newcastle area. Both functions will be attended by the bank's chief inspector, Mr. A. deV. Stewart Richardson, and the northern inspector, Mr. J. H. Spark. When the bank opened in Newcastle 100 years ago its office was a subsidiary to Maitland which, at the time, was a far larger town than Newcastle. Both branches had the one manager, a Mr. Alexander Stuart, who was obliged to visit Newcastle from Maitland at least once a week. Day-to-day affairs of the branch were administered by a resident accountant. The bank, which is Australia's largest trading bank and the first bank and oldest public company in Australia, today has more than 850 branches and agencies and a staff of more than 7000. In Newcastle it has 12 branches and agencies and many others scattered throughout the Hunter Valley. Newcastle Sun (NSW), 11 June 1953.